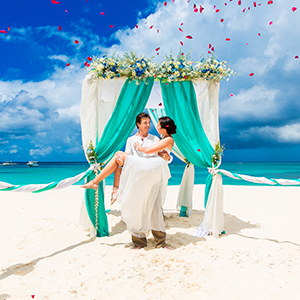 Planning your beach wedding for the new year? There will be so much to plan, but it’s tough to get started on making any of those important decisions before you have your color palette. The color palette will help you shape your decisions on what dress to buy, which flowers to get, and which bridesmaid dresses your girls will be wearing. Picking the colors is step number one on your journey to a picture perfect wedding! 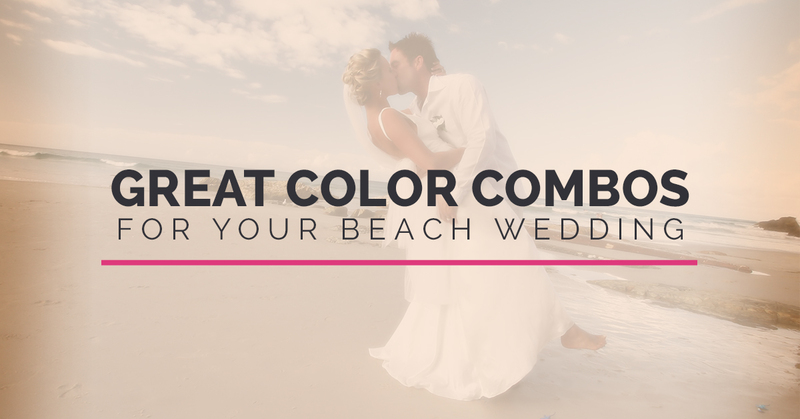 Our Orange Beach venue has seen weddings done in every color and thanks to our experience, we have some tips that will help you find the right colors for your wedding, too. Check them out! Get inspired by the setting. A beach is a gorgeous place to have a wedding and it’s packed with inspiration for your big day. Consider pulling your color palette from the environment around you! Choose shades of blue to match the water and the sky or gorgeous golds to pick up the colors in the sand and sunset. It creates a cohesive look for your wedding and a color palette you can’t go wrong with using throughout your event. Another option is to play against the beach palette and pick bold colors that will stand out against the backdrop of water and sky. Picking a bold color to focus your wedding decor on will help make the colors pop in your photos. Choose colors that contrast nicely against the blues of the background; warmer colors will do the trick, so look for reds, oranges, and yellows that you love. If you want to achieve a minimalist, classy look for your wedding, don’t underestimate the power of a neutral palette. Your wedding can look picture perfect when you stick to black and white or incorporate some gorgeous metallic tones. Metallics are considered neutrals in the decor world, so embrace the copper trend or go all out with gold. It’s a tried and true combo that looks great at a beach venue or anywhere else. Turquoise and coral! We love this color combination because it picks a color from the water (turquoise) and combines it with a bold color that will pop in the photos (coral). It’s fun, oh-so-fresh and gives you plenty of options when it comes to your dresses, flowers, and accessories. We hope to see many more weddings using this gorgeous combination on our beach in the coming year. Seafoam and lavender. Seafoam is a softer cousin of turquoise and pairs nicely with a lavender tone. This is a really versatile combination that is gorgeous while being a little softer than the bold combo above. Gold and purple. The color combination of yellow and purple became popular in weddings a few years ago, and while we still love it, the upgrade to gold is a welcome new addition. Using gold alongside your purple tones is a great way to bring in a little bling to your wedding. Blush and rose gold. Another metallic-inspired combination, blush and rose gold are like sisters in the color world. The look a lot alike, they are both beautiful, and they compliment each other perfectly. Blush is ultra-romantic as a wedding color, and you’ll be spoiled for choice when it comes to rose gold accessories as this is one of the season’s hottest on-trend colors. Navy blue and white. This is a gorgeous combination that’s classic and fresh at the same time. Navy is going to be a hot color in 2018, and you’ll be seeing it in more weddings as well as home decor, so now is the time to embrace it. Deep shades will add a touch of elegance to your wedding and pop against a white background. Softer than black-and-white, it’s a beautiful backdrop for your wedding. Having Trouble Finding the Right Color Combo? If you are having trouble deciding on the right color combinations, don’t panic. It’s a big decision, so you should take your time making it. Start by browsing wedding color palette ideas on Pinterest or wedding planning sites. There will be plenty to look at and you might find a picture that you totally fall in love with and want to use as inspiration for your own big day. If not, look for a piece for your wedding that you love and pull your color palette from it. We know one bride who designed her wedding around the tie she found for her groom; she pulled her colors from the tie and the entire thing was stunning. You might find your color inspiration in a bouquet of flowers, your bridesmaid dresses, or a special piece of jewelry you’ll be wearing. Finally, if you can’t decide on a palette, start planning anyway! You might find that a palette naturally emerges. Just choose things you love and your wedding will loook great and reflect your personality and relationship. Need help planning your wedding in 2018? We offer beach weddings in Orange Beach and we’re ready to book your big day! We have all-inclusive packages that make wedding planning a stress-free breeze. You can learn more about our packages on our website, where you can also book a free consultation with our team to learn more about our venue. Give us a call or contact us online to get started!